If in our daily life we can smile, if we can be peaceful and happy, not only we, but everyone will profit from it. This is the most basic kind of peace work. (Thich Nhat Hanh) Peace does not mean to be in a place where there is no noise, trouble, or hard work. It means to be in the midst of those things and still be calm in your heart. For the sake of my family, my community…for the sake of peace in the world, today I make inner peace my highest priority. Choose to meet each experience with an intention for peace. Be aware of any feelings of anger or irrationality and replace the feeling with calm. Envision any areas of unrest transformed into safe havens for all people. See beyond conflict and discord to the truth: peace is everywhere present and active. 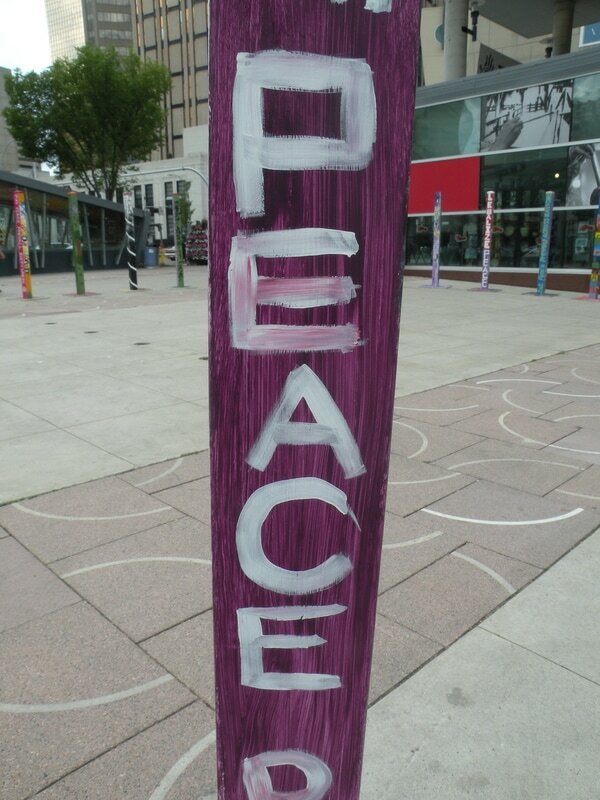 Edmonton Peace Pole display "May Peace Prevail on Earth"
If your mind is filled with negativity, it is hard to experience the good in life. If you focus on peace, joy, and love in your life, you will experience more of that. Find peace in nature. Turn off the television and computer and ask your parents if they will take you on a nature walk. Appreciate the beauty you encounter and the quiet and stillness. Inspirational Video: "Right to Peace"